Scandal Chat: Is Mellie Playing A Long Game? Obvious spoilers for this week's episode. I'm in love with this show. The drama and the intrigue are just unmatched in any other primetime show right now. J'adore. Anyway, debate time. I don't think Mellie loves Fitz at all. I think she's been over Fitz since the campaign trail. Mellie wants to run for public office one day and being the First Lady will work in her favor. She's annoyed at Olivia sleeping with him only because it'll hurt his chances of being reelected and thus hurt her chances of being elected to some office later on. 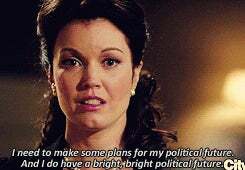 In last night's episode, Mellie realized that Fitz can't get reelected without Olivia's help (however that manifests itself) and so she asked Olivia to be campaign manager again. 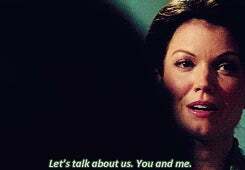 HOWEVER, Mellie doesn't have Fitz's best interests at heart. I think she's just playing a long game-getting him elected again and acting like a supportive, kind, caring wife will get back some of the goodwill she lost after she publicly criticized Lisa Kudrow's character. On top of that, the male campaign manager told her that her public image is basically that of a cold bitchy shrew. Mellie needs Fitz to stick around, get reelected and not divorce her if she wants any kind of career after Fitz leaves office. I think she is well aware of this and is basically using him until she gets what she wants.